I never got to go to the Metrodome, but saw the magic of the place in the few years of watching baseball in it on TV. While Target Field is an awesome place to watch a baseball game, the Metrodome had its quirks. The 2009 Minnesota Twins still have to be my favorite team of all time. Not many are left playing from that team. Francisco Liriano and Anthony Swarzak (!) are still hanging around. It is truly amazing how fast time flies. Edited by Diesel, 17 April 2019 - 09:25 AM. I wish odorrizi had and era .05 higher, so it was equal to the start time. Edited by Sconnie, 17 April 2019 - 10:06 AM. Carnac the Magnificent: Great intro. Ed McMahon: Thank you, your Sageness. I described only the merest shadow of your true greatness. Carnac: No, dummy. That's the answer to the question inside this envelope. Ed: Oh. I thought you had enjoyed your stage introduction. I misunderstood. Carnac: Misunderstood? I can imagine that you were a misunderstood child. Ed: In some ways, I suppose. Carnac: Also a misunderstood adult, and a misunderstood magazine shill. Ed: Now that seems hurtful. 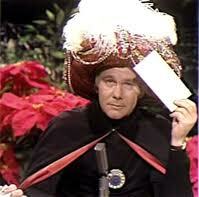 Carnac: The fleas of a thousand camels in your tightie whities would also be hurtful. Ed: They would indeed. I hope that is not a curse you are bestowing. Carnac: I'm on the fence. Ed: This also sounds painful. Ed: In any case, perhaps we should proceed with the actual business at hand. Ed: No sir. Would you be so kind as to open the hermetically sealed envelope? Carnac: (rips envelope, blows into it, removes card) What is "Catherine The"? We've had a passel of grandkids at the Chief household the past few days. Last night, I secretly listened as they said their prayers before bed. One of them was shouting at the top of his lungs..."DEAR LORD, BLESS MOM AND DAD AND GRANDMA AND GRANDPA, AND CAN I PLEASE HAVE SOME NEW HOT WHEELS CARS, AND A BIKE, AND A NEW VIDEO GAME? AMEN"
His sister looked at him and said "Why are you shouting? Jesus isnt hard of hearing." I was at that game with my wife sitting straight up from 3B about half way up the lower bowl. I remember my wife asking to leave by the 4th inning and I refused because I kept telling her that you never know when something special will happen. She never understood why I refused to leave a game early. She soon figured it out! That grand slam ball was crushed. I don't recall seeing many balls hit that far in BP let alone a game. I knew it was gone as soon as it left the bat. Half of those that attended the game had left already and yet that place was shaking as Kubel trotted around the bases. That was place was electric. I'll never forget that atmosphere. Hard to believe it's been 10 years already. My wife never asks me to leave a game early anymore. She understands. I must have searched wrong. I stopped by my usual bar on the way home from work last night, and as I sat down at the bar, I saw two hunks of beef hanging from the ceiling. "Ralphie," I said to the barkeep, "what's with the meat hanging from the ceiling?" "Its a challenge, Chief. If you can jump up and touch them, you drink free all night. If you can't, you owe the bar a round. Care to try?" I thought a minute, them said "No. The steaks are too high." I'll never forget the last thing my grandpa said before he kicked the bucket. "Hey sonny, how far do you think I can kick this bucket?" If one order is Amazon Prime eligible and the other is not, I would consider that to be a violation of the PED policy. I think this game will be postponed. I don’t think Toronto comes back to Minnesota this year. A double header tomorrow seems likely. Who’s your 26th man? Romero? I think it will be a “straight” double header. I can’t imagine either game sold well based on attendance the last two nights. An earlier start to game two would be better for getaway day anyway. Edited by yarnivek1972, 17 April 2019 - 03:13 PM. LEN III says that he's talked to Twins officials and they say that they're going to try to wait it out and get the game in tonight. Whether the weather (ha!) accepts this plan is another story however. Future radar seems to indicate rain steady until at least 9. Sure, they could start then. But I think waiting until tomorrow makes a lot more sense than playing on a soaked field in front of zero fans and starting at 10 at night. I have tickets, so I don't disagree with that in the slightest. I'm debating whether or not even to make the trip downtown. If it weren't for the magnet schedule (the one giveaway I covet), there'd be little chance that I do. They’ll likely get it in. I live about three miles from the stadium and rain is down to a 50% chance in the 7pm hour and 30% in the 8pm hour. Future radar via weather.com shows it lasting until roughly 8:30. Figure the earliest they could start is 9pm - 2 1/2 hours after scheduled start time. Sure, they could. But, why? What is the upside? Let’s say they start at 9 and get done at midnight. They play at noon tomorrow. Meaning, they are on the field, in uniform by 9 am. That’s a pretty quick turnaround. Factor in playing on a soaked field. Sure, it drains very well, but it’s not instantaneous. Factor in playing in front of an empty (or near empty) stadium. The bottom line is entertainment, right? If no one is being entertained, what’s the point? Sure, double headers aren’t fun and even less so on getaway day. But, even playing two games, they should be done no later than 8, barring extra innings. Plenty of time for both teams to get to their next cities at a decent hour. It’s the better choice IMO and I suspect the Twins will eventually see it that way too.